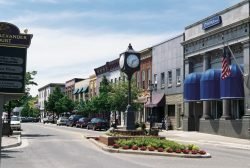 Located perfectly between Ann Arbor and Detroit, Plymouth is a city known as “The Village of Homes”. As its motto suggest, Plymouth is a great community to live and work, filled with parks, theatres, and year-round festivals. In the center of town lies Kellogg Park, a quintessential area surrounded by eclectic shops and restaurants. The park hosts many of Plymouth’s iconic festivals throughout the year. The Plymouth Ice Spectacular is the largest and oldest ice-carving festival in North America while “Art in the Park” is Michigan’s second-largest art fair. Green Street Fair, the Fall Festival, “Music in the Air”, and the “Old Village Restaurant Crawl” round out the rest of the year. Plymouth has a rich history which is celebrated at Henry W. Baker House, Plymouth Historical Museum, and Greenmead Historic Park. Other Plymouth favorites are Penn Theatre, The Village Theatre, Maybury State Park, and Hermann’s Olde Town Grill. Howl at the Moon is the country’s biggest name in Dueling Piano entertainment. Howl2GO delivers our amazing, high energy show to any venue in the Plymouth area. 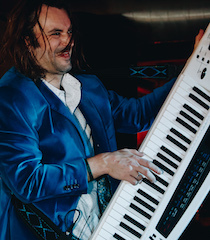 When you bring Howl2GO to Plymouth, you can be certain you’re getting the true Howl at the Moon experience, and with that comes the assurance you are booking only the best dueling piano performers in the country. Our fun, energetic performers are perfect for all events anywhere in the Plymouth area. Howl2GO provides all the production you need to make your event look and sound amazing. We have top of the range PA sound systems and custom built lighting shows that you will not see anywhere else. Our competition simply does not begin to come close to our production! We also supply our custom built electric baby grand pianos that can be transported into any size or shape venue in the Plymouth area. Regardless of how many guests you’re expecting, from 20 to 2000, we have you covered! We specialize in all types of events, anywhere in the Plymouth area company parties, wedding receptions, charity fundraisers or house parties are all made more fun by bringing Howl2GO by Howl at the Moon. We tailor every single show to you and your guests, playing music for all ages. Fundraising for churches, schools or your chosen cause is perfect for our show – plus advertising that you have Howl at the Moon performing is a huge draw in the Plymouth community. Howl2GO is the only dedicated Dueling Pianos company in Plymouth and our team works tirelessly to ensure your event is perfect. Our production team will deal directly with your Plymouth venue and, in conjunction with our Wedding Specialist, sales director and our amazing piano players, create a customized event just for you. Our Howl at the Moon musicians will take you guests’ requests live just as they do in one of our many nationwide venues. Since our inception in 1990, Howl at the Moon has been the number 1 place for bachelorette parties, and now Howl2GO has become the number one choice for Plymouth area Dueling Piano wedding entertainment. From your ceremony, through announcements and you first dance until the last guests leave the dancefloor following your reception, our live Wedding music will keep everyone on the dance floor all night long. Choose us, the experts in Wedding entertainment, and don’t take a chance on a local act who will not provide the professional performance required of the biggest night of your life!